I have to admit that I simply love this craft supply basket. I have lots of ribbons and beads and I urgently needed a basket to store them in. Here is what I made out of an old paint plastic can with a lid. This was an ugly white plastic one pound can of paint. Here is how the recycling and transformation has take place. It’s a decoupage idea, because first I decoupaged the basket with mild orange napkin. I decoupaged both the lid and the outer walls of the can. I let it dry and used hot glue gun to wrap it up with a piece of lace. I got this lace just for few cents on our local flea market. The bottom of the shabby chic craft supply basket was not nice and it had the sticking up ends of lace. So, I used some recycled pieces of blue purse to cut out a circle and cover it up. 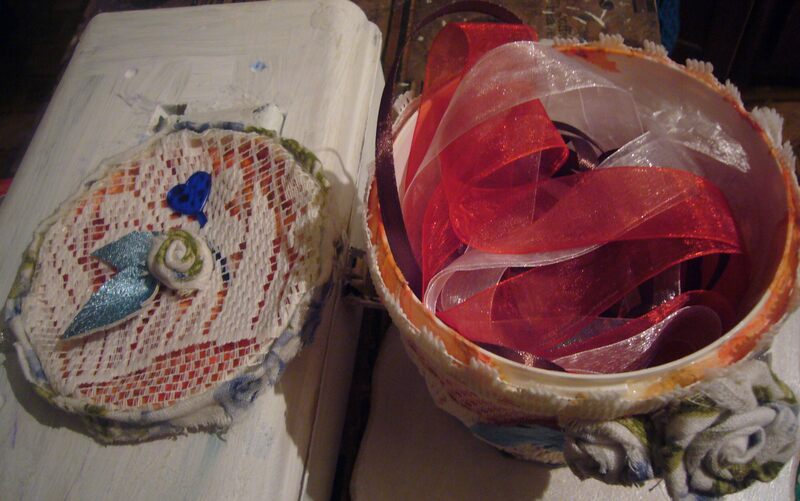 Then I made tissue roses and leaves and decorated the shabby chic craft supply basket. These rolled fabric roses look nice and they are easy to make. I may share the quick tutorial in the next post. Take a look at some of the other recycled baskets I have made and order one for your jewelry or supplies. 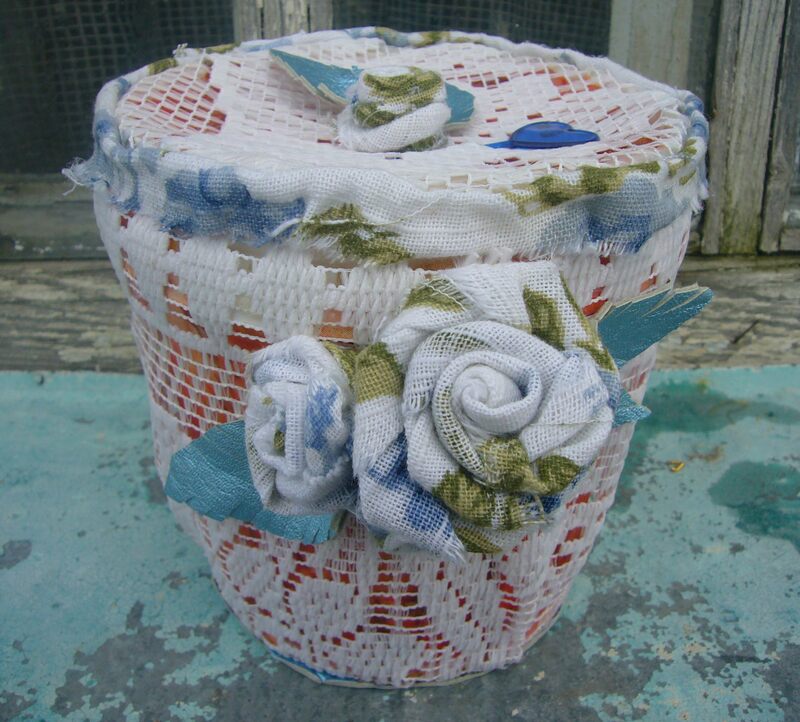 This entry was posted in Crafting Tutorials, Go green and tagged crafts, decoupage ideas, DIY, fabric flowers, handmade, handmade basket, jewelry box, recycled crafts, shabby chic craft supply basket, shabby chic how to, tutorial, upcycling. Bookmark the permalink.